The game is really just perfect on so many levels. Simple animation creates the illusion of complete freedom and helps players connect with the central character. The environment is manipulatable, with falling floor tiles that leave debris when they crash. The sultan’s guards in their elaborate dress create compelling villains rather than the generic monsters featured in most games of the time. The puzzles never seem overwrought, but give just enough difficulty to keep players involved. Each level of fers new surprises, from finding your own sword, to having to fight against your evil alter-ego, created by jumping through a magic mirror. Perhaps most unique was the addition of a timer. The game had to be beaten in 60 minutes. In a sense, every play-through was a speed run. 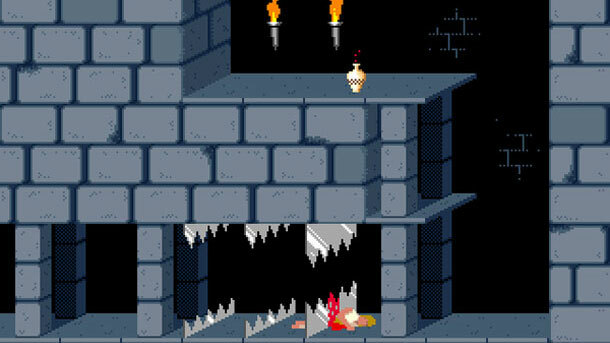 Initially you played to try to solve the puzzles, taking all the time you needed. 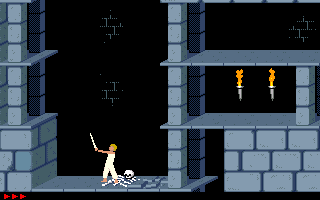 Once you’d done that you had to start over and play it through flawlessly to have enough time to solve new puzzles. I can’t imagine having the patience for it now. Most amazingly, it holds up! You can download the demo or play it online in a variety of places. The amazing advances weren’t really technological. This game could have been made five years earlier. What set it apart was the attention to detail. And that makes it a game that can still revive those original feelings of awe and excitement. 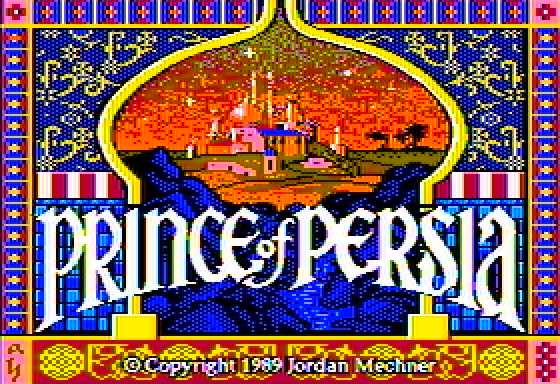 This entry was posted in First Impressions and tagged Brøderbund, First Impressions, Prince of Persia.